In the 1960s and early '70s, British children spent Saturday mornings at their local cinema clubs instead of watching television. BBC Saturday mornings occasionally featured imported cartoons while ITV showed bought-in films or Gerry Anderson reruns. In the late 1960s the BBC tried thematically linking Saturday children's programmes, but it was LWT who introduced live links between bought-in items, expanding them in Saturday Scene (ITV, 1973-76), which ran in London from 1973. ATV tried a similar experiment in the Midlands with TISWAS (ITV, 1974-82), which a few years later would become ITV's best known Saturday show. In 1976 Bryan Cowgill , BBC1's Controller of Programmes, offered to fund a Saturday morning show if a suitable format was found. 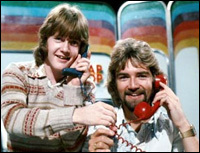 DJ Noel Edmonds fronted Multi-Coloured Swap Shop (1976-82) that October and its 'all-access' format was an instant success. By contrast, ITV spent the rest of the decade with a patchwork of regional programmes competing across the network. TISWAS was not shown outside the Midlands until Spring 1976. When Saturday Scene ended that autumn, its presenter Sally James joined TISWAS but LWT persisted with its own programmes: Our Show (ITV, 1977-78) attempted to make a show "by the kids for the kids", with guests interrogated by an overpopulated panel of four young presenters, including Nicholas Lyndhurst and Susan Tully . Riddled with mistakes and poor presentation, the show was recorded on Thursdays before transmission, not really in the spirit of Saturday morning TV. Autumn 1977 saw Yorkshire run a low key strand called, confusingly, Saturday Scene , which included a 45-minute show, Calendar Kids , presented by a young Mark Curry. Grampian offered Scene on Saturday to Northern Scotland while North East England ran the prosaically-titled Saturday Morning on Tyne Tees and later Lyn's Look-In , both hosted by Lyn Spencer . Alastair Pirrie and Christine Anderson fronted their North-East successor Saturday Shake-Up in 1979-80. Linking other programmes, these basic packages reinvented the Saturday Scene wheel. By the end of its 1977-78 run, TISWAS was airing in six regions, but in July Southern Television launched The Saturday Banana , and when TISWAS returned in Autumn 1978 it was relegated to the Midlands while Banana was near-networked. Goodies (BBC, 1970-80) star Bill Oddie presided over a rather ramshackle if interesting affair. Its surviving edition includes, among pop guests and a game of Runaround , a live debate on fox hunting (conservationist Oddie locking horns with equestrian correspondent John McCririck ) and a visit to a local museum run by children. LWT's rather arid The Saturday Morning Show followed in January 1979, with Steve Jones and Elvis Payne hosting. It boasted impressive guests ( Penelope Keith , Eleanor Bron and The Clash on the first edition) but was pre-recorded. ITV's in-fighting was finally resolved by the Autumn 1979 strike. A total blackout curtailed the first networked Saturday show (the overly complex Mersey Pirate ), and a second series of The Saturday Banana was cancelled, leaving TISWAS when ITV resumed broadcasts in October. Only Tyne Tees continued with its own programmes. At last the war was BBC vs ITV, with both TISWAS and Swap Shop attracting large followings: Swap Shop spoke to David Bellamy about conservation issues, TISWAS had Lenny Henry dressed up as Bellamy , exclaiming 'Gwapple me gwapenuts!'. There were pockets of resistance within ITV - TSW had The Saturday Show (1982-4), with local wacky DJ Ian Calvert. Number 73 (1982-88) from TVS the same year mixed a fictional framing device with live guests and went network in 1983. Other experiments included Fun Factory (Granada, 1980) with Jeremy Beadle and Sham 69 singer Jimmy Pursey among the staff of a factory and later the spin-off element of Motormouth (TVS, 1988-92), set in a TV studio. The approach was perhaps taken too far by the BBC's Parallel 9 (1992-4), set on an alien planet. Simpler live-in-studio formats have persisted since the mid-1980s. The BBC made virtually the same show from Television Centre for twenty years with Saturday Superstore (1982-87), Going Live (1987-93) and Live and Kicking (1994-2001), the only changes being the presenters and the pace. BBC summer efforts like Get Set for Summer and On The Waterfront performed adequately - only 1987's contrived It's Wicked failed badly. ITV tried outdoor summer roadshows, with the mobile Get Fresh (1986-88) and Ghost Train (1990-91) visiting the regions. The BBC dominated Saturday mornings throughout the 1980s and 1990s, but foundered against Ant and Dec's SM:tv Live in Autumn 1998. But following their departure from the show and the axing of the ailing Live and Kicking , The Saturday Show has been the BBC's response - the battle is well and truly rejoined.